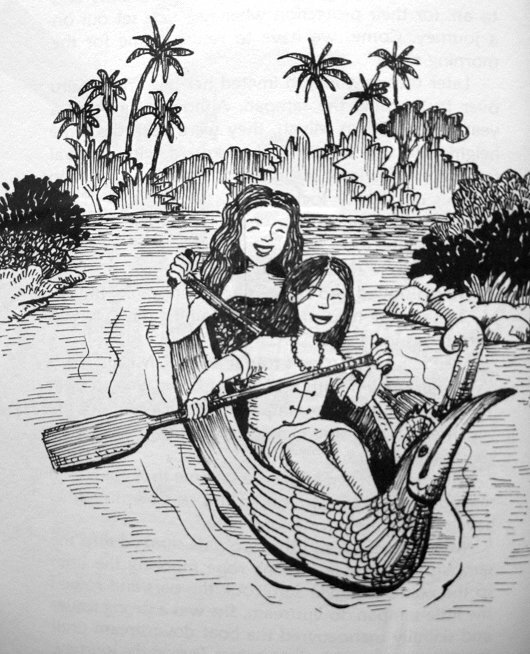 Miyah and Suru go for a boat ride. Illustration by Choong Kwee Kim. So what is the Forest Demon? This creature from Bidayuh and Malay folklore - the infamous Hantu Rimba - grabs and 'swallows' the unwary who are unfortunate enough to cross its path. But what is the Hantu Rimba really like? What was its true nature? What did it sound like? The folklore tends to be quite sketchy about such matters - we only know about its ogre-like eating habits. But I had a more manipulative and subtle entity in mind. 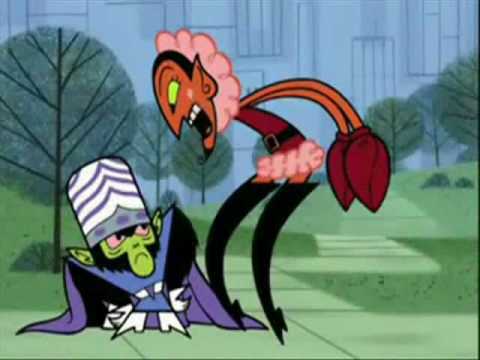 Even Mojo Jojo is scared of the vile and scary Him! high-heeled boots (which could be concealing cloven hoofs) and spoke in a high-pitched falsetto. But it was his voice which was truly scary - a high chilling voice with echoes which turns to a sinister basso profondo when infuriated. To me, it sounded like many layers of voices speaking at the same time. This voice effect is used quite often now, in films of demonic possession. To cut to the chase, Him's voice helped me to 'visualise' the evil entity for my book. So the Hantu Rimba of Bidayuh folklore acquired some of the attributes of Him. 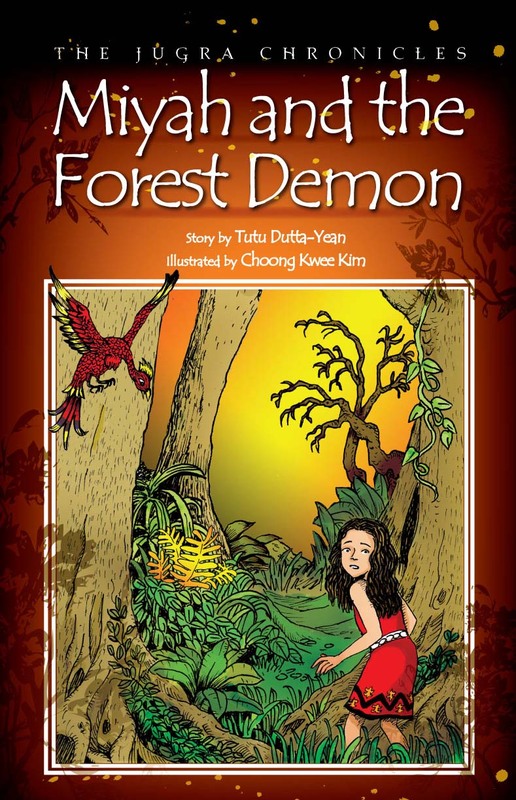 Of course, the true nature of the Hantu Rimba has to be uncovered in the second book, Rigih and the Witch of Moon Lake, otherwise it would be impossible to vanquish it (the devil is in the details). The second book picks up the story three years after the first book. Miyah's cousin and friend, Rigih, is the main protagonist. He is aided in his quest to rescue Miyah by the mysterious Witch of Moon Lake. The Witch herself is based on the traditional Kadazan/Dusun shamanic healers known as Bobohizan (female) and Bobolian (male). These shamans have deep knowledge of herbal lore and are also the keepers of old tribal customs and traditions. They spend long hours in meditation to go into a trance where they are able to travel to the spirit world. In the past, they also played an important role during the planting and harvest season to invoke the rice spirit for a bountiful harvest. I believe, there are still some practicing Bobohizans and Bobolians in the state of Sabah. Oddly enough, in the southern islands of the Philippines, female shamans are known as Babaylians. The cover illustration is by Tan Vay Fern. The cover and the black and white illustrations on the inside are by Tan Vay Fern. She made the Witch/ Bobohizan more beautiful than I had imagined, but I'm not complaining! Her forceful personality comes through from the unwavering, direct gaze. Vay Fern used stylised traditional motifs from Sarawak and Sabah in her designs for chapter headings and also for the costumes of the characters. 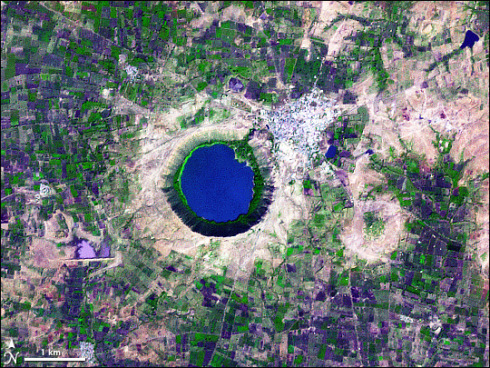 Lake Lonar seen from space. Copyright NASA. So what is the myth behind Lake Lonar? 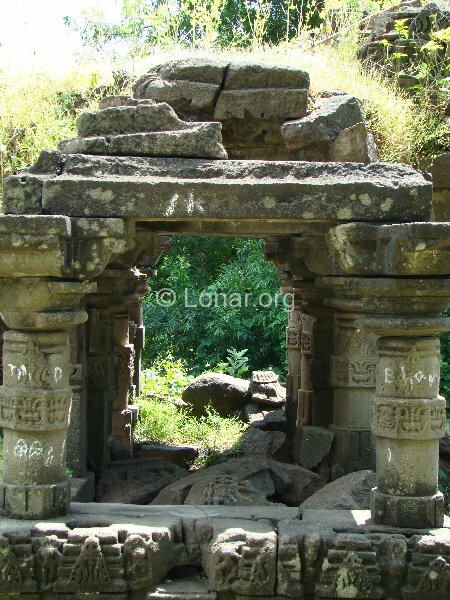 According to local folklore, a great underworld demon called Lonarasur (Lonar-Asura) would venture out at night and torment the people living in its surroundings. The people prayed to Vishnu (a Deva) for help. In answer to their prayers, Vishnu assumed the form of a beautiful young man called Daitya Sudana, who persuaded Lonarasur's twin sisters to reveal the location of the demon's lair. It turned out to be a subterranean cavern underneath a hill. Vishnu lifted up the hill and found the demon hiding in his circular lair. He tossed the hill away and it is said to have landed near the village of Datephal, 35 miles away from Lonar where there is a conical hill. Vishnu slew Lonarasur in his lair - and his blood formed the salty water of the lake. The number of ruined temples along the shores of the lake indicate that people must have sensed the powerful magic emanating from the place. Did I get my idea for Moon Lake from Lake Lonar? Not really. I've known about meteorite impact craters for a long time and had already made up my mind to incorporate one in my story. But the research into crater lakes uncovered Lake Lonar and gave me a sense of the place. The Rigih book was supposed to have been published last year. In fact, all the illustrations and layout had been completed but Eric Forbes thought that it needed more editing. As I had already read the text for the umpteenth time (umpteenth meaning at least 12 times), I allowed a couple of months to elapse to 'forget' the book and gain some distance and objectivity. Sometimes you need to forget what you have written to look at your own work with fresh eyes. When I reread it, I felt compelled to make quite a lot of changes. 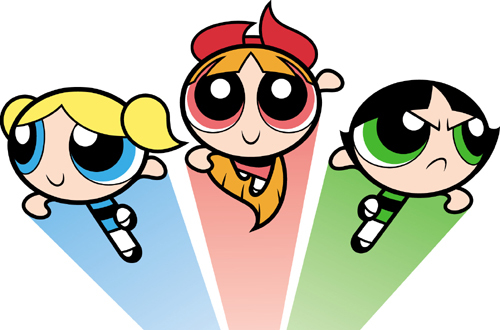 There were no major changes to the storyline or plot but the dialogues and characterisation had to be revised. I felt some of the story sequence lacked continuity as well. In the end, some sentences were deleted and I may have added 5-6 more pages to the book; hopefully it made a difference. I didn't try to be literary or quirky, in fact this is probably the most severely edited book I have ever written. Of course it was not just more work for me; Eric and Alan Wong had to put in extra time; not to forget Ng Seng Chee, the DTP person who had to painstakingly make all the changes, word by word, and redo the layout as well! is not only in having the flashiest or slickest feeling site. So what are these important Search Engine Optimisation Research tips?